I studied in Israel a few summers ago. It was a life changing experience… in more ways than I can tell! Studying in Israel was one of the best things I have ever done… but going in the summer was insane! It was desperately hot like an oven… oppressive… and the sun scorched everything it shone on! We would travel and tour and hike in the heat of the day… crazy tourists! Only tourists would do something like that! Can you picture us… a rag-tag group of very weary students dressed in holy garb (knees covered, shoulders covered, head covered) crisscrossing all of hot, dry Israel with water bottles in hand and wet wash clothes tied around our necks for comfort. Our clothes were soaked with perspiration, that traveled in rivulets of uncomfortable sweat down our backs. Wearing baseball hats, and sun bonnets, and straw beach hats and sometimes wet rags… anything to keep the sun off of our heads. We were tired and always thirsty! What a sight we must have been! This was not a study group for the faint of heart! We were a mish-mosh traveling band getting first hand experiences in the land we came to study! We would know how long and how arduous our daily treks would be… they correlated to the number of water bottles we were required to carry and drink. A four bottle hike would not be the “wee little stroll” our teacher told us, but a hilly, boulder climbing excursion with the top of a mountain as our goal. A four bottle “wee little stroll”~ a small water source is to the right. One thing became quite apparent as we covered Israel… everything needed water! Water is a precious commodity in Israel. I noticed something so interesting when I would look out over the dry parched land as we traveled by bus. Once in a while I would see a beautiful patch of green… or a long green sliver running through the color-of-a-dry-bone country. When I would see green I would know that there was living water… a stream… or a river… or a spring… or even once, a waterfall! Water would bring life and lushness back to even the most dusty, dead looking land! It was an amazing sight! The living water, water that gives life, would come tumbling over rocks in it’s bed, running along and splashing life to the dry ground around it! And that ground was thirsty!!!! Who would have known that there was life in the bleached ground just waiting to be awakened by living water? I also learned that not all water is living water. Some water, which pool and is still, is not living water. Living water has a source and runs along from the source. It is active! 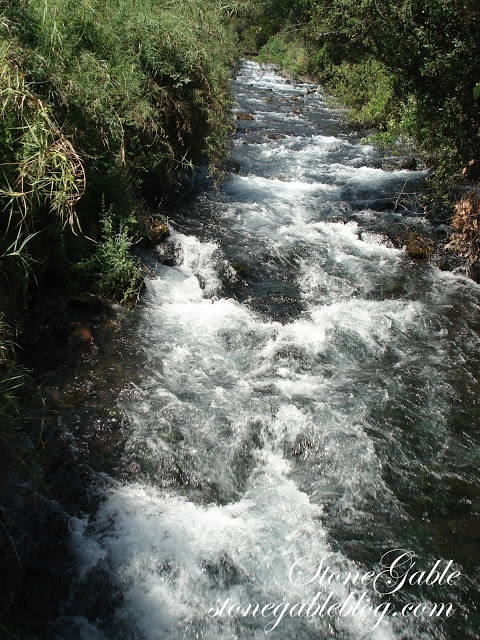 The closer to the source… like a spring or a mountain crevice… the purer the water. Water that is not living water, like cisterns, can get stagnant and polluted. The best visual example of living water was at the the TEL DAN NATURE PRESERVE. This was the most lush place we visited in all of Israel! We walked along a densely tree covered 5 mile path skirting the mouth of the Jordan river… far to the north of the Sea Of Galilee. It looked so different than the rest of Israel we traveled! 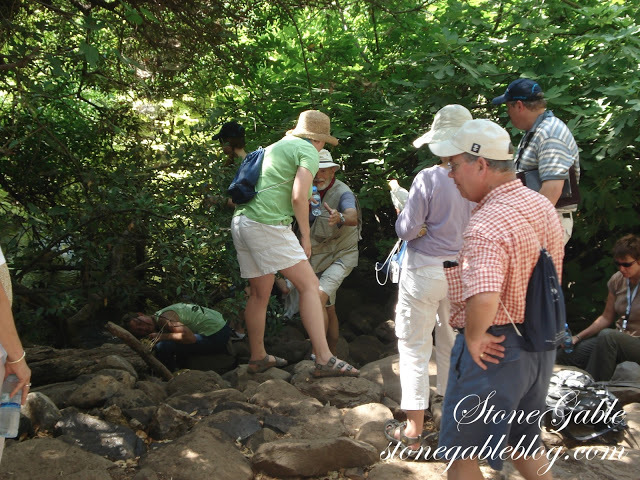 As we got near the water source, Mount Hermon, we filled our empty water bottles with it’s Living Water. Some of our group even splashed around in it. It was cold and delicious and life giving to our group of parched, hot visitors! This wonderful water would run and bubble and make it’s way to become the Sea of Galilee, the Jordan river and eventually the Dead Sea where it pools and can not sustain any life at all! But near it’s source it was full of life… and I got to partake of it! I love how God uses everyday things around us to teach us poignant spiritual lessons! 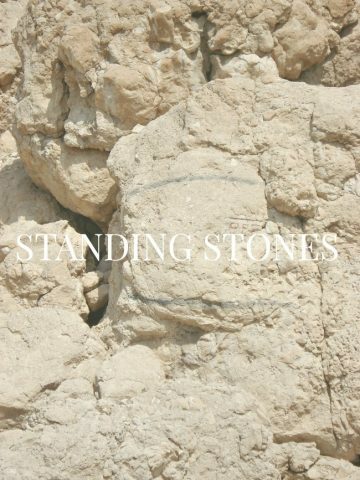 To the ancient Jews, water was even more important than it was to our group of students. We had hotels with running water, well equipped rest areas dotted all over Israel, water stations, and hundreds and hundreds of water bottles! The Jews of Jesus’ time relied on wells and natural water sources. They clung to water for their very life. After my trip to Israel, I can understand what a thirsty life many ancient’s lived! Living water was just that… water that gave life! It was precious and protected! Jesus used this every day concept of living water to teach a very important spiritual truth. Can you see Jesus and his disciples traveling in a land unfriendly to the Jews… Samaria. They were taking a shortcut from Judea to Galilee. No Jews traveled through Samaria… they were unclean people! But Jesus and his disciples did! It as hot, and dusty and dry and so were Jesus and His group. 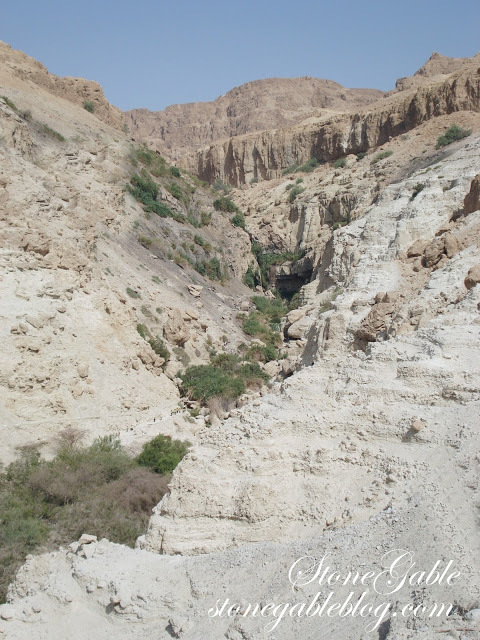 Jesus was tired and thirsty and rested by “Jacob’s well” near the city at high noon. The sun was scorching and Jesus was feeling the effects of his travels. His disciples had gone “into the city to buy food”. There he met a woman…a Samaritan… a people hated by the Jews. But being hated by the Jews was the least of this woman’s problems! She was also an outcast from her own people. She was thirsty in a way that no water from Jacob’s well could quench! So there she was drawing water from the well at noon and didn’t know that she was about to meet the lover of her thirsty soul! Jesus asked her for a drink. What a great way to start up a conversation by a well… and so it did! I am amazed by the love Jesus had for the very least of society, like this poor woman! She had a deep thirst and Jesus told her that He had Living Water to quench her longing soul! She knew what living water meant. 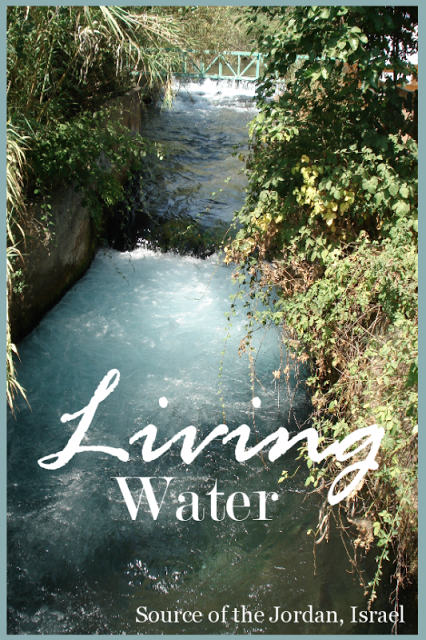 Water, like the water I drank from the source of the Jordan… fresh, cold, pure and life giving! She was parched and dry and dead… the water Jesus would give her was life… eternal life! The Holy Spirit is Living Water to our thirsty souls! The woman received Jesus’ Living Water… not only did she receive it but she offered it to the dry and dead people of Samaria. They drank it too and new life sprang up inside them! As I go through my day, I see a lot of dry and thirsty and dead people around me. They many not even know it. But like the Samaritan woman, I have a spring of Living Water bubbling up inside me too. It’s active and life giving!!!! And like the living water, that runs along in streams or rivers or springs, in the parched land of Israel, I can splash it all over my spheres of influence and bring life to all who it touches! If Jesus is your LORD and savior, you too have the Living Water of the Holy Spirit. It is an unending, fresh source! 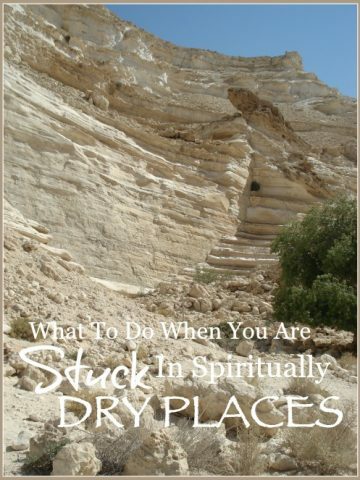 Dive in the Living Water… paddle around… jump in it’s puddles and make big splashes so the people around you… spiritual thirsty, dusty, tired people can be drenched with Living Water! Walk through your day dripping wet with it! You might be surprised by the life that springs up all around you! 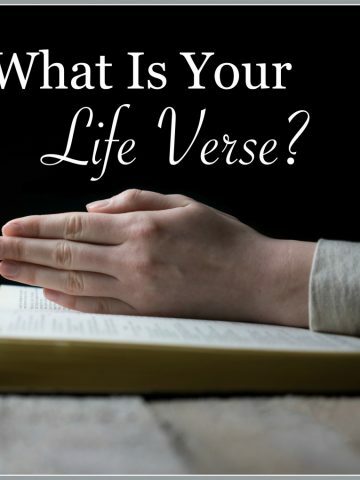 WHAT IS YOUR LIFE VERSE? Beautiful post, love how you have drawn deep from the River of life, and have shared your insight and blessing in this glorious post. I have wanted to know more about this truth and have been blessed to have come here. As we drink deep, we are like a tree planted by the river whose roots always draw a constant flow that our leaves at the tip of the branches never whither-wonderful meditation. But we are to not only be filled but to do as you so eloquently said bring life to the dry, parched, thirsty, and dead souls in need of a deep drink of refreshing life, in the midst of the desert. I find them everywhere not difficult, send a text, check in with someone who is bereaved, depressed, widowed. Send a care package to a friend with a copy of this post or a transcript of a sermon on a topic they are thirsty for, some will be grateful, many will not bot for those who will oh, how they will be blessed Thanks Yvonne, may your leaf never whither. Sounds like the same study trip I went on three years ago. 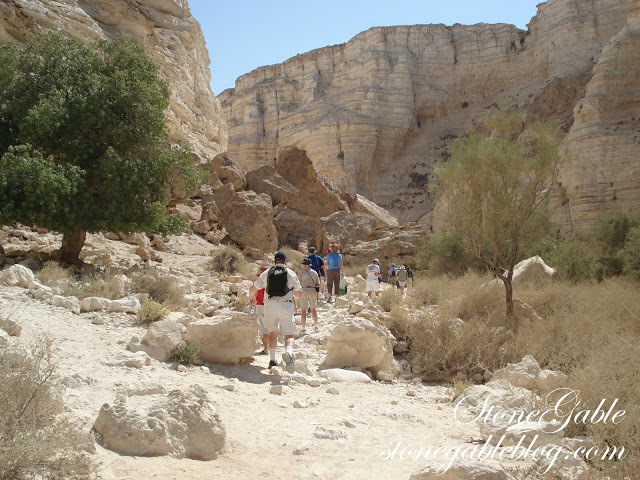 The lesson that stood out the most was the one on Living Water after a long hot hike at En Gedi. Thank you for that reminder and bringing back such a cherished memory. We are kindred spirits. Wonderfully inspirational. Thank you Yvonne. Love your spiritual messages. Yvonne, love your Sunday posts, food and water for my soul! Yvonne, a wonderful expose of what our Heavenly Father has to offer! Thank you for sharing you experience. Appreciate your Zest for life, which flows from you precious relationship with Christ! Love your Blog! Blessings as you continue to create and share! I have just become an admirer of Stone Gable ! Inspired by your walks in life, Thank you. has produced so much fruit. Thank you, Yvonne, you are a kindred spirit. I love your thoughts and that you share your light with us. Thanks for reminding us of this living water, than replenishes us in so many ways. Love your Living Water post today. How inspiring! Blessings to you and thanks for sharing your trip to Iarael. Beautiful Sunday lesson! Thank you. Lovely post. I would appreciate a post with your thoughts on sharing the living water in ways that go beyond just exhibiting Christian behavior, e.g., kindness, compassion, with people who don’t want it, but need it the most. Thank you made my day to read this. Leaving in June for Mediterranean trip will keep this in my heart. So thankful to have that source of Living Water!